The crew that sails for the Yacht Club Costa Smeralda’s perfect pair of wins reflect excellent crew work, good starts and speed in the choppy seas and SE’ly winds, which seemed to be changing all the time in terms of strength and direction. Tactician Vasco Vascotto was on top of his game, winning off the pin end of the line and gaining early on the left of the first race then completing a thrilling come from behind second win only on the final quarter of the last run of the day. After starting the day level on points with Azzurra, Harm Müller-Spreer’s Platoon are now second while a solid 3,4 day for Ergin Imre’s Provezza sees the Turkish-flagged team leapfrog Quantum Racing, who did not start so well and scored a sixth and seventh. The Italian/Argentine combination of owner Alberto Roemmers Jr., helmsman Guillermo Parada and tactician Vasco Vascotto on Azzurra came out blazing in Race 3, winning the pin end and earning the early advantage on the left side of the first upwind leg. Following closely on their heels was Provezza, who rounded second. Bronenosec, who started closer to the committee boat, was able to work the top left of the first beat and gain a slight edge over a pack of boats in contention for third place. Day 1 leaders Platoon, and series leader Quantum Racing both struggled off the starting line and rounded in the bottom half of the fleet. Azzurra tried in vain to break away from the group, building its lead to as much as 150 meters at times. But in the shifty, puffy conditions — the breeze and sea state both noticeably reduced from Tuesday — there were opportunities aplenty, chances to surge forward and threaten the overall lead. Around the final windward mark, Azzurra had a solid lead on Bronenosec, with Sled, Rán Racing and Provezza rounding out the top five. But Bronenosec, helmed by Vladimir Liubomirov, fought all the way down the run, closing the gap and at times appearing to take the lead. The Azzurra crew kept their composure and won the race by a scant 4 seconds over Bronenosec, identical margins to Day 1’s slender margins. Provezza moved up to third at the finish with Rán Racing in fourth and Sled taking fifth. When Vasco Vascotto is hot, the fiery Italian tactician for the Azzurra team can seem at one with the wind; and he’s nearly impossible to beat. The Azzurra team seemed to have every base covered, right side, left side, middle—and in every position from first to last. 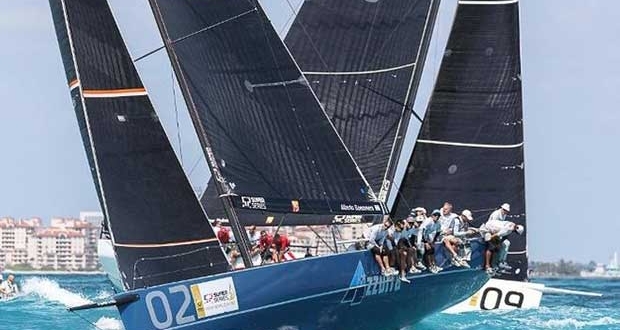 But when it came to the finish line, it was Azzurra taking the gun, their second back to back win, and a commanding 8-point lead in the overall standings after four of 10 scheduled races. Azzurra had another great start at the pin end of the line and after less than a minute of sailing was able to tack and cross the fleet. But halfway up the beat, with the left side seemingly winning out, Vascotto had second thoughts. He tacked back to the left, leaving Alegre and Rán Racing, both of whom had second-row starts, all alone on the right side. Those two boats, in that order, led around the first mark with Bronenosec in third and Azzurra fourth. The Italian/Argentinian team jibe set, but the right side of the course, looking upwind, wasn’t profitable on the run and halfway through that second leg Azzurra was mired in last, 300 meters or more behind the lead group. Alegre and Rán Racing led through the gate, followed by Provezza, Sled and Platoon. It was on the second lap where Vascotto worked his Miami magic, picking his way through the fleet, rounding the final windward mark in third and then nailing the last quarter of the run to take the win. Platoon also rebounded from an eighth in the day’s first race and deep in the fleet of the second race to take second. Rán Racing was third and Provezza continued their steady sailing to finish fourth. Alegre was fifth while Sled, in position for a top five finish, dropped to ninth after being whistled for a foul just meters from the finish. Working round the clock through Tuesday night and all the way through Wednesday seems set to pay off for the Gladiator team. After their new boat was badly damaged in a collision on Tuesday their industrious shore team and crew had their substitute boat – their 2015 red Gladiator – re-rigged and ready for delivery to Miami from West Palm Beach, aiming to be ready to resume racing Thursday. They will be granted redress for the races missed. 10. Gladiator (Tony Langley, GBR) (7, RDG/7, DNC/12, DNC/12), 38. “In the second race we had a very good start we were able to tack and cross ahead of the fleet, but then we were stuck a little in the middle of the course and we got passed from the right and from the left. Then we caught a fishing buoy close to the top mark also that made our lives a little bit difficult again. On the first run, we chose the left, that didn’t pay a lot, but then out of the gate we were able to hold into a very dirty lane behind Platoon because we were on a very big lift and we were able to hold there for three minutes and that was enough to grab the header and cross and position ourselves properly. We were lucky that it worked out. 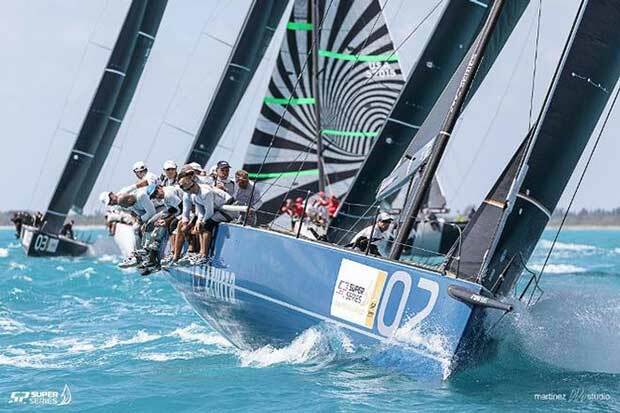 About those first wins of the season for Azzurra?